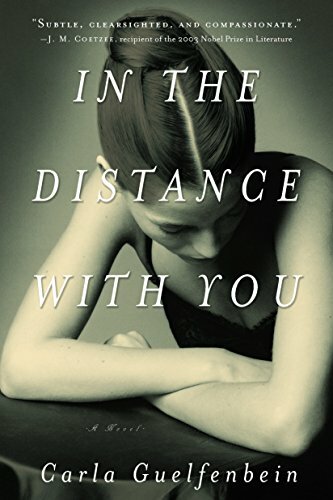 Tension between the inescapable distance that exists, and must exist, between people, and the driving desire for closeness is what ties together the characters in the accomplished and sensitive novel, In the Distance with You by Carla Guelfenbein, which won the distinguished Premio Alfaguara award. Titled after the famous song by Cuban songwriter, César Portillo de La Luz, the novel sings, in often lyrical prose, about various kinds of loves as well as the particular problem of romantic love. At the center of the novel is Vera Sigall, a Chilean writer, inspired by the real-life Brazilian author, Clarise Lispector. Around Vera, who never appears in person in the book, are Emilie, a young Franco-Chilean student, and Daniel, a Chilean architect. Brought together by Vera’s mysterious fall and her comatose state, the two characters try to discover not only what happened to her, but more importantly, what might exist beneath their own crumbling selves. Daniel and Emilie possess their own fractures. They search for that which might provide a clue to their deepest selves and identities. Might they be creators, too? Will something grow? The third character, Horacio, a longtime literary friend of Vera’s, is on a journey to understand his relationship with Vera. He works backward through memories of their various crossings and meetings, and ultimately understands that Vera had seen into him more deeply than anyone else, deeper than even he himself could. She’d been a silent collaborator. He realizes, “I thought about the enormous potential for destruction that adversity has. Love abides in the lover’s ability to resist that potential together.” In this, they failed. And he learns, “Something unprecedented was taking shape in me. And for it to happen, I’d needed to die a little, I’d needed to pass through that no-man’s-land where there’s no life, no air, no hope. That’s the nature of beginnings. . .”. He must swallow pride and accept humility. In an unconscious effort to do so, he insists that Emilie should research Vera’s work for her thesis, propelling her to discover the truth the binds them all. Beginnings and endings, exchange and disconnect are what define these lives. Each of the characters is rendered in a first-person voice, suggesting that Guelfenbein is trying to show us that we are locked in our own perspectives, trying to get out, to connect and understand, yet the path to understanding might exist only in the imperfect mirror that another can provide, not the meshing of lives. Love can’t be found in another, but rather only in the pull and play between two people who are willing to engage one another, to be one another’s collaborator. In Guenfelbein’s hands, the various levels, kinds, and meanings of contact are explored as characters come into and out of contact in both time and space, present moment and memory, the spoken and the written word. One is left to wonder whether it is ultimately through the excavating of other stories, lives, words, and secrets, that we might find unknown parts of ourselves. What is the distant place? What it is not is a physical place of any sort. In fact, the novel represents a kind of Latin American literature that looks predominantly to Europe and European sensibilities. While reflective of life of the upper class in the southern cone, the novel does not explore particular Chilean ways of being. The reader is left with the unfortunate notion that these characters live and float in a world detached from place or time. What might the distant place be then? Is it the unknown self or simply the unattainable self? Is it the fear of never knowing another, or the acceptance that this is the nature of life? Or is the distance a place where we meet and relish a resonance that cannot exist anywhere else except between two selves who are vulnerable, uncertain, and willing to grow? Guelfenbein has written a thought-provoking subtle novel that invites the reader to ask these and other questions. Sylvia Torti's most recent novel, Cages, is a finalist for a 2017 Foreword Indie Book Award for Literary Fiction. Her short fiction, book reviews, and both literary and scientific essays have been published in anthologies, journals, and magazines. She is dean of the Honors College at the University of Utah.